This month the Artistic Outpost monthly Product Focus Feature is on the stamps found in the Patriotic stamp category on the AO Website. All stamps in the Patriotic stamp category are on sale for 20% off through May 9, 2015! 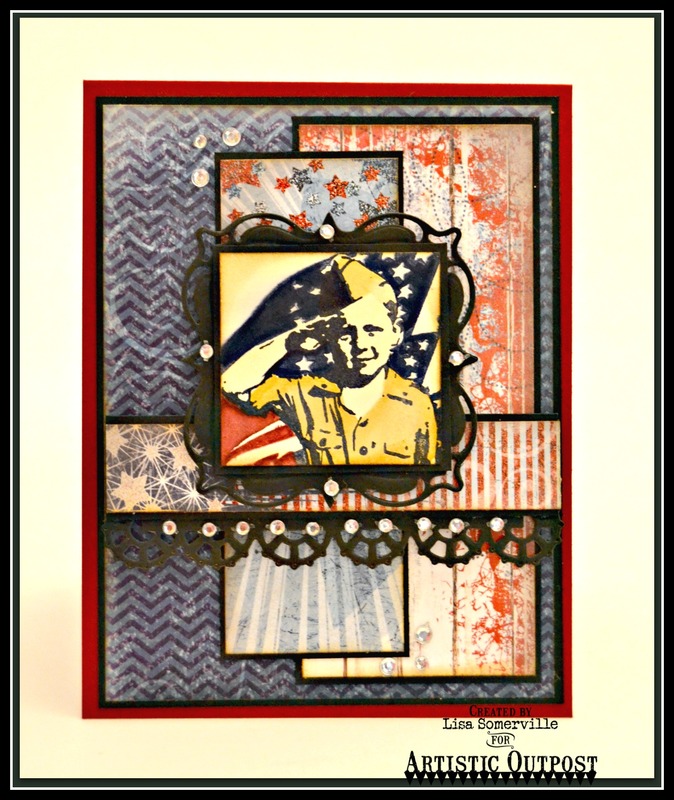 I love to create Patriotic cards, and used images from the Hero stamp set to create my card. I stamped the sweet little solider boy in Black Archival on Vanilla card stock, masked the image with Eclipse tape then stamped the flag. The image is colored with STAEDTLER Karat Aquarell Watercolor Markers, all edges are sponged with Gathered Twigs Distress Ink. The beautiful papers are from Our Daily Bread Designs Patriotic Paper Collection. The border and frame are from the ODBD Layered Lacey Squares die set. Great layering of papers and colors. Very fun patriotic creativity! j. No one can layer up pretty papers like you, Lisa! Love the way you colored the little guy, masked and placed the flag behind him! Love this card!